Your knife block can be a breeding ground for bacteria. Gross! 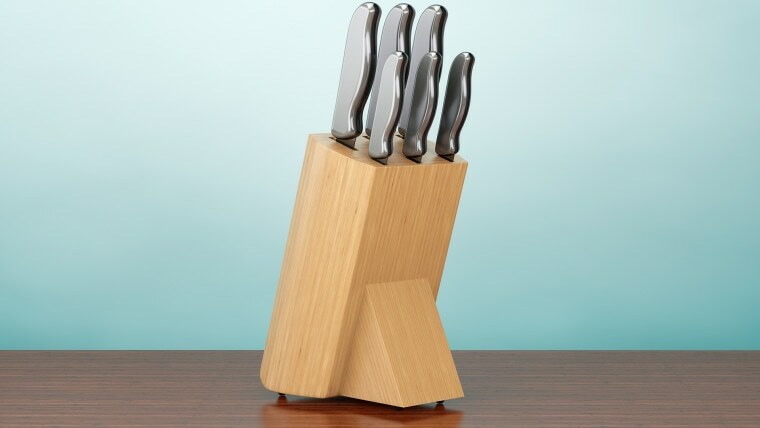 Is there anything better than a knife block? It's a safe, convenient and organized way to keep your tools accessible on the kitchen counter or island. But, chances are, those little slots are holding more than the blade of a knife. According to Allen Rathey, principal of the Healthy Facilities Institute, those openings can become a breeding ground for bacteria. Yuck! To keep knives ready for use, clean the block regularly — about once a month if knives are used frequently. Here’s how the pros do it. First, remove the knives and turn the knife block upside down to shake out crumbs that may have collected inside. It may help to tap the underside with a small hammer to loosen debris. A large pipe cleaner may also help dislodge anything that's stuck to the bottom. This is an important step because crumbs will be harder to remove once they’re wet. Hand wash the block in hot, soapy water, cleaning the slots with a small brush, such as a baby bottle brush. Dry the block upside down on a clean surface. Don't skip this step! Reinserting tools into the block before it is completely dry can trap water and promote the growth of bacteria, which is exactly what you're trying to avoid. If you're in a rush, try a hair dryer or electric fan to speed up the process. To keep mold and bacteria from building up in the block, make sure the entire knife — blade and handle — is clean and completely dry before inserting them into the slots. Want more tips? Read on for directions on how often to mop your home (and the right way to do it!). This article was originally published on Oct. 2, 2017.